Ruby Lee Coffey is one of the youngest children of the Coffey Family - who due to there curvaceous figures have been dubbed the ‘Australian Kardashians’. The Coffey Family are a huge name in the Surfing and luxury travel industry and have a combined Social Media following of over 2.7Million. 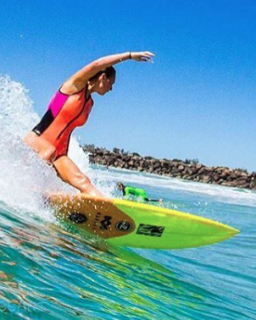 Ruby Lee Coffey is a free style and professional surfer who has been sponsored by Billabong and Simmo Surferboards The family are renowned for being seasonal travellers chasing an endless summer and the perfect break.